Tests by a German environmental group have found levels of the carcinogenic herbicide 4-300 times higher than is allowed in drinking water in the European Union. Tests by a German environmental group on the 14 best-selling beers in Germany have found that all of them contained traces of the carcinogenic herbicide, glyphosate. The Environmental Institute in Munich said it conducted the tests to highlight that these products can contain levels of the herbicide higher than is allowed allowed in drinking water. Even the beer with the lowest levels of glyphosate had over four times the legal limit for drinking water which is set at 0.1 μg/l (microgrammes per litre, equivalent to 1 part per billion, or ppb).The beer with the highest levels had close to 300 times the glyphosate that would be allowed in water. The results come at strategically important time. For the German beer industry 2016 is 500th anniversary of the Beer Purity Law which, in 1516, stated that the “only ingredients used for the brewing of beer must be barley, hops and water”. This predecessor of modern consumer protection laws ensured the quality of a product and threatened legal sanction against those who fell short. But more importantly, they come in a week when the European Commission has announced its intention to relicense glyphosate for use in the European Union for another 15 years. According to a press release from the Greens/European Free Alliance, the EC will be debating the matter further early in March. In Germany industry and government have sought to downplay the report. 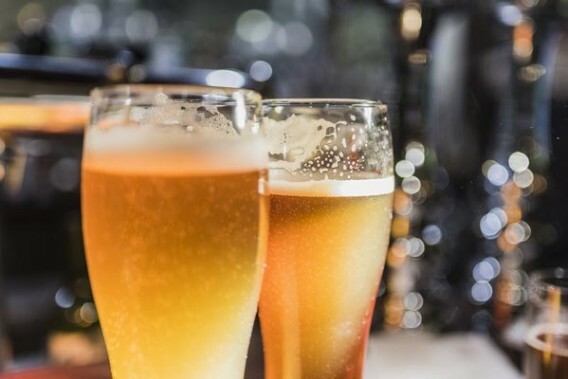 The Brauer-Bund beer association said that the findings, which were based on a small number of samples, were not credible and that levels detected were too low to cause health problems. According to the available evidence it may not be. Glyphosate is a hormone disrupter and this means that it does not obey the law of “the dose makes the poison”. With hormone disrupters smaller doses can have big effects. Studies in animals have shown disturbing toxic effects at dilutions of parts per trillion – many times more dilute than the ‘safe’ dose allowed in EU water. The truth is no one knows at what level glyphosate might be safe – and it can be argued that if a substance can potentially cause cancer in humans no level is safe. In the EU testing for pesticide residues, including glyphosate, in food can be patchy. The UK does regularly test its food but this has not been the case in the US. Only last week the US Food and Drug Administration (FDA) announced that for the first time ever it will being testing for glyphosate residues. The FDA says the delay is because testing methods have until now been too costly. But more likely it is responding to public outrage after the herbicide was declared a ‘probable human carcinogen‘ by the United Nations’ International Agency for Research on Cancer. Globally, glyphosate use has risen almost 15-fold since so-called “Roundup Ready,” genetically engineered glyphosate-tolerant crops were introduced in 1996. 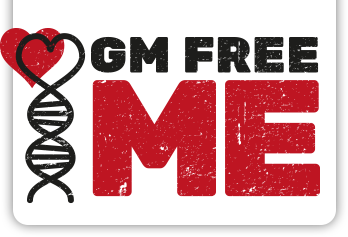 Worldwide 9.4 million tons of the chemical have been sprayed onto fields – enough to disperse nearly half a pound of Roundup on every cultivated acre of land in the world, making it the most widely used agricultural chemical ever. While the US has raised so called ‘safe levels on crops, and the EU pushes ahead with relicensing the herbicide for another 15 years, France has taken steps to limit the sale of Roundup in its stores, and the Netherlands, Denmark and Sweden have also moved to restrict its use in certain cases. Glyphosate is sprayed on cereal crops as a desiccant (to dry them out) before harvest, and its use in the UK is increasing. This is why surveys of bread in the UK have found that 60% of loaves contain residues, with glyphosate being the pesticide most frequently detected. Although there has never been equivalent testing of beers in the UK, there is no reason to suppose that British beers are any ‘cleaner’ than German beers. 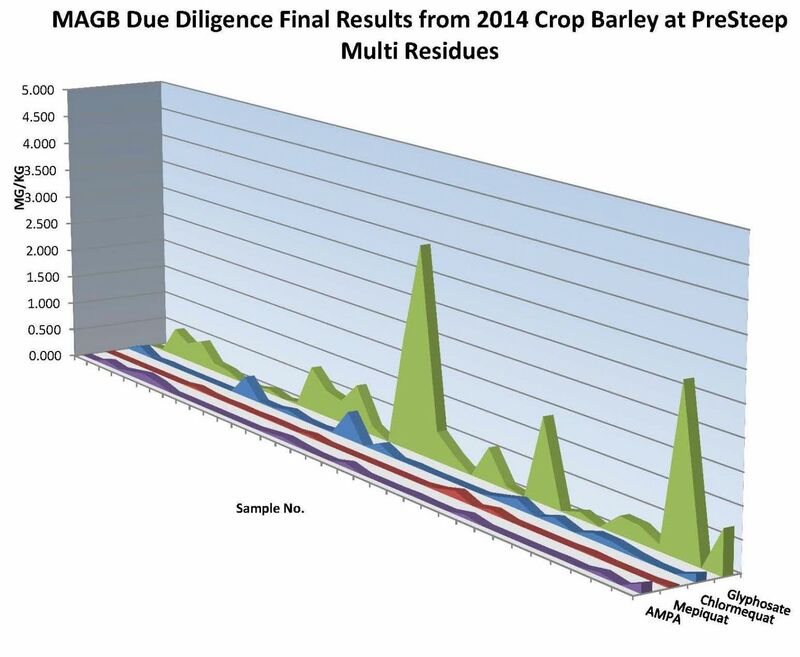 Figures from the Maltster’s Association to Great Britain show that glyphosate is one of the most commonly detected pesticides in barley (see chart above). The MAGB say that member companies regularly monitor their barleys for pesticide traces. It maintains that during malting a substantial proportion of chemical residues are washed from the grain by the steep water or are destroyed during kilning. This means there are likely to be varying levels of glyphosate in British beers too. Until our own government and the European Commission see sense, and as with other things we eat and drink, switching to organic beer may be the best course of action if you wish to avoid a toxic brew that could give you more than a hangover. For more on the toxic effects of glyphosate see our article Glyphosate – what’s the problem? For background on the relicensing of glyphosate in the EU see the Beyond GM article EU one step closer to relicensing glyphosate.